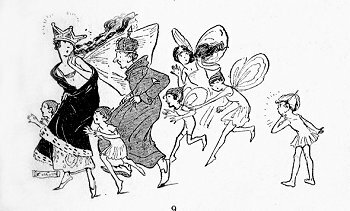 The fairy Queen was sitting in the Council Chamber of her Palace, hearing various charges against the fairies, and deciding on their punishments. Only one case remained to be heard. "Fairy Pinktoes!" called the Queen. "Here, your majesty!" said a very timid little voice, as a tiny fairy with drooping head stepped forward. "What is the charge?" demanded the queen. "Sneezing, your Majesty!" stated the High Chamberlain, in a horrified tone of voice. "Sneezing!" ecchoed the Queen. "Disgraceful!" "P-p-please, your Majesty, I c-c-couldn't h-help it," sobbed Pinktoes. "But you MUST help it," said the Queen sternly. "Sneezing is a VERY serious crime. You might give your cold to all sorts of fairies. Good gracious! You might give it to ME!" "I d-d-did try not to," snuffled Pinktoes, "but---"
She stopped, and a look of horror came into her eyes. She waved her arms madly, and made horrible faces. "Whatever is the matter?!" cried the Queen in alarm. "Goodness!" 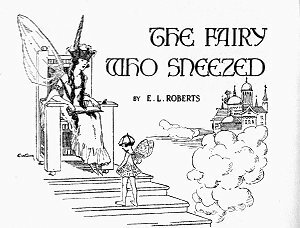 she shrieked, "she's going to sneeze again!"